“Rats, I’ve really done it this time. Gary’s not going to believe this!” I started the long walk up the hill, imagining his reaction to my latest fiasco as I stared into the darkness ahead of me. “You locked the key in the van when you stopped at the mailbox?” He asked. “Well, yeah, I must have bumped the lock with my knee. But, that’s not the only problem. The other key is in my pocket book, and that’s in the van. And there’s one more thing. The van’s still running and the headlights are on!” I smiled at him, he rolled his eyes, and we climbed into the truck to go back down the hill. Under the truck’s lights, we circled the van trying to find a way to open the doors or the hood latch. Unfortunately, the locks on the doors weren’t reachable with a coat hanger like in the old days, and we didn’t even consider breaking a window or a latch on our two-day old Astro van. We decided to go back to the house and try to call someone from the Chevy dealer. Climbing into the truck, Gary turned the key, but instead of the welcome sound of the engine starting, we heard, click, click, click, click, click, click – dead battery! So, leaving the truck to keep the van company, we walked the six-tenth of a mile back up the hill, still in pretty good humor considering the situation. We wondered how long the van would idle on three-quarters of a tank of gas! We couldn’t reach anyone from the Chevy dealership, so Gary called a local locksmith, who kindly agreed to help us at that late hour. We drove down the hill to meet him in our 67 Corvette, again leaving the lights on, but this time also leaving the motor on to preserve the battery. 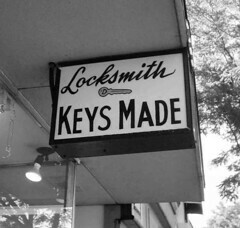 First, the locksmith tried each of the 400 master keys on his giant ring, but with no luck. “If I can get a good look at cuts in the key, I might be able to make a key that will open the door,” the locksmith said as he shone his flashlight into the van at the key dangling down from the steering column. As he drove away to get his hand-held key cutter, we turned toward the Corvette, just in time to hear cough, cough, sputter, cough, sputter, sputter as the engine died – out of gas! The van ran all night, but by the time Gary walked down the hill in the morning, it was silent, turned off by the conscientious locksmith who returned at daylight to successfully defend his key-making reputation. By 8:00, the van, truck, and Corvette all sat safely at the house, ready for another adventure. Good car key habits – needed them then, still need them now! See Locking Keys in the Car. Filled under: Family and Friends, Just for Fun, Popular | You can follow any responses to this entry through the RSS 2.0 feed. Last month, I left it twice in one day – on the Penney’s counter and at Mark’s Valley View. That’s a first!